Life is full of variety and fun... and different. 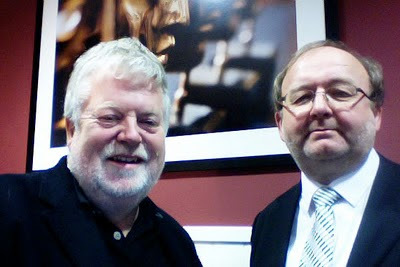 This week, to support a new school project Prof. Stephen Heppell and I had to film a video podcast (or vodcast). No problem with that - it's a great project we both believe in, but due to time commitments for both of us we filmed it in a location that was convenient for both - and so BAFTA was selected. (SH is a BAFTA judge - hence access was no problem). Whilst I have had several meetings there with him before, me filming a short interview style vodcast at the home of the British Academy of Film and Television Arts just felt a bit wrong to me - almost fraudulent really, Bafta winning stuff it certainly wasn't! But interestingly we filmed it from the in built camera and mic in a MacBook Pro ( don't ask why not via a separate camera - it's a long story). Despite being balanced on a chair which was in turn balanced on a table, the quality was fine and really demonstrates the ever increasing power of these mobile pieces of kit to support all types of working and learning. The first pubic airing of this piece of filming (and possibly the last) is at the weekend - we await the reaction. One thing for certain is that it won't be nominated for an award! it actually was very good - i saw it at the school in question - a very interesting and unique design. well done for being involved. Art work - well she's only 3! Education - it's a small small world.. Snow at the start of term... Ouch!